"Valentine's Day is special for us because it is our wedding anniversary as well! Though this isn't a standard 'romantic' recipe, every time I prepare this dish the love flows freely! It is a way to show my husband I love him -- it is his favorite, but not mine. Every time I serve it my husband showers me with compliments, affection, and love because he knows it's my way of saying I love you any day of the week, not just Valentine's Day." 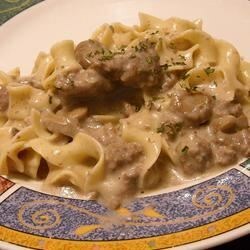 Everybody approved, but it's really just homemade Hamburger Helper stroganoff. This recipe states 10 3/4 cup of milk. I know that must be a typo but others may not know. Everytime I make this everyone oohs and aahs over it! I put it over whole wheat wide egg noodles and it was yummy!